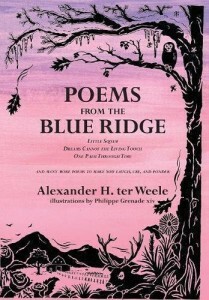 Poems from the Blue Ridge is a work of art. Indeed, two works of art in a single volume. On the one hand, a compendium of poems—inspiring poems, complex poems, playful poems—and on the other hand, a collection of sketches—inspiring sketches, complex sketches, playful sketches. The reader will return to these pages time and again to contemplate the art of the written word and to appreciate the art of illustration. Skim through a few pages. You will immediately wish to own this book!